Networks of wireless sensors are currently attracting considerable interest in many technology circles. The massive computer and telecommunication markets have driven the price of state-of-the-art electronic chips down to consumer levels. Today it's relatively easy to attach a radio to almost any electronic device and remotely communicate with it. As a result, many groups are presently investigating what to do with this exciting confluence of technologies. This article focuses on one such enabled technology, the Sensor Web, which has been successfully developed and deployed in a variety of environments and is already providing significant value to end users. What Is a Sensor Web? 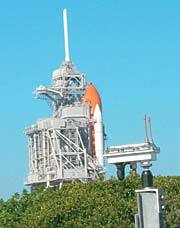 In 1997, the Sensor Web was conceived at the NASA/Jet Propulsion Laboratory (JPL) to take advantage of these consumer-market chips and use them to create platforms that share information among themselves and act as a single system. This system would be embedded into an environment to monitor and even control it. The purpose of a Sensor Web system is to extract knowledge from the data it collects and use this information to intelligently react and adapt to its surroundings. It links a remote end user's cognizance with the observed environment. 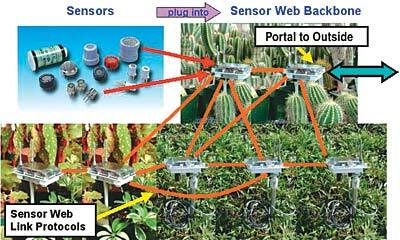 In general, the Sensor Web is a macro-instrument comprising a number of sensor platforms. These platforms, or pods, can be orbital or terrestrial, fixed or mobile (see Figure 1). Figure 1. 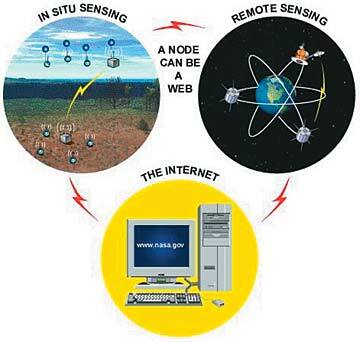 The generalized concept of the Sensor Web focuses on an architecture that is about sharing information for collective use and includes both terrestrial and orbital platforms. Coordinated communication and interaction among the pods provides a spatio-temporal understanding of the environment. Specific portal pods provide end user access points for command and information flow into and out of the Sensor Web. At JPL, the focus has been on in situ Sensor Webs, with the resulting system output viewed over the Internet. Wireless networks are not a new approach to environmental monitoring; it's common to find systems in which remote sensors in the field communicate to central points for data processing. The Sensor Web, however, is an amorphous network, creating an embedded, distributed monitoring presence that provides a dynamic infrastructure for sensors. By eschewing a central point on the network, information flows everywhere throughout the instrument (see Figure 2). Figure 2. The Sensor Web forms an information backbone that creates a dynamic infrastructure for sensors in pods. So far this sounds like the typical ad hoc, self-configuring network. Often the ideas of hopping information around such a network are framed in terms of the power advantage gained by doing so. While this is certainly true, the Sensor Web concept goes one step further: The individual pods within a Sensor Web are not just elements that might communicate with one another—they must communicate with one another. Whereas most wireless networks are typically discussed as a confederation of individual elements (like computers connected to the Internet), the Sensor Web is a single unit. The pods of a Sensor Web are akin to the cells of a multi-cellular organism. The primary purpose for information flow over a Sensor Web is to get data to the rest of the Sensor Web rather than to an end user. By design, the Sensor Web spreads collected data and processed information throughout its entire network. Its communication protocol is structured for both omni-and bidirectional information flows. Omnidirectional communication implies no directed information flow, while bidirectional communication lets end users receive information from the Sensor Web as well as send instructions into it. As a result, information on the Sensor Web can result from four types of data: raw data sensed at a specific pod; postprocessed sensed data from a pod or group of pods; commands entered into the distributed instrument by an external end user; and commands entered into the distributed instrument by a pod itself. Since there is no specific routing of information, all pods share everything with one another. This global data sharing allows each pod to be aware of situations beyond its specific location. Pods may combine data across the Sensor Web to determine the speed and direction of a moving front, something that a single-point measurement can't produce. Pods may also use neighbors to examine the stochastic nature of their local measurements to determine whether or not the data are well behaved. A Sensor Web pod consists of several basic pieces. First, there's the radio that links each pod to its local neighborhood. The NASA/JPL Sensor Web pods use radios operating in the 900 MHz license-free ISM band with an upper range of ~200 m or more. Next is the microcontroller, which contains the system's protocols and controls the radio; it can also carry out data analysis as needed. The power system in the NASA/JPL system uses a battery pack with solar panels to keep the batteries charged. The combination of solar panels and micropower electronic design have kept Sensor Web pods operating in the field for well over a year without requiring any maintenance. The sensor suite is the final component, and it's determined by the specific application. Since there is no distinction between instructions originating from end users and those from other pods within the system, the Sensor Web is both a field-programmable and self-adapting instrument. Bidirectional communication also allows portal pods to be linked (by Internet or satellite) so that the end user of a particular Sensor Web may be another web. As a result, a local Sensor Web can leap beyond the bounds of its own spatial confinement—an important consideration for very large-scale environmental studies. This technology's capabilities are useful in a diverse set of applications ranging from precision agriculture to perimeter security to effluent tracking. Wireless networks of sensors are often marketed as a replacement for running wires to sensing points. Naturally, this holds true for the Sensor Web as well. It's more significant that the Sensor Web, with its global information sharing, forms a sophisticated sensing tapestry that can be draped over the environment. This Sensor Web approach allows for výrious complex behaviors and operations. These include on-the-fly identification of outlying sensor readings by averaging values over subsections of the Sensor Web; mapping of vector fields from measured scalar values and interpreting them locally; and single-pod detection of critical events, which then triggers changes in the global behavior of the Sensor Web. With the objective to do real in situ environmental work, the NASA/JPL Sensor Webs Project has been aggressive about fielding instruments in a variety of demanding locations. 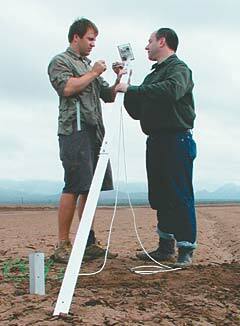 As early as 2000, the project ran a continuous five-month test of a Sensor Web in several adjacent greenhouses at Huntington Botanical Gardens in Southern California. By 2001 the next generation of Sensor Web replaced it, and a browser-based interface allowed streaming data from this new system to be monitored over the Internet in real time. The Huntington Gardens staff has used this system to remotely monitor the state of its greenhouses and to ensure that watering (from both sprinkler and rainfall patterns) is uniform across various areas. Figure 3. NASA/JPL team members deploy a Sensor Web pod in a flood basin outside Tucson. The extended stand allows the pod to stay operational above rising waters. Other deployments followed in a variety of exotic environments, including wetlands on the Florida coast at the Kennedy Space Center, remote eastern ice sheets of Antarctica, desert areas of central New Mexico and Tucson, and a greenhouse simulation of an Amazonian rainforest (see Figure 3). More details of these deployments, as well as real-time streaming outputs from several of the active Sensor Webs can be viewed at the NASA/JPL Sensor Webs Project. It's a significant challenge to engineer Sensor Web systems that can be fielded, unattended, for indefinite periods of time ranging from months to years. For example, there are complex tradeoffs involved between the sophistication of the protocols and the power available for the radio. Packaging must be lightweight yet robust to withstand both desert heat and mountain snow. Moreover, for a user community to adopt it, the system doesn't just need to be well engineered; it must also be easily deployed. The overall simplicity of the Sensor Web system as an operational instrument is demonstrated by the fact that most Sensor Webs are deployed and operated without requiring assistance from the NASA/JPL team. From these field experiences, it becomes apparent that many of the usual metrics for evaluating wireless sensor systems need to be reconsidered. For example, the number of elements in a network may actually not be as important as the number required to cover a unit area. Wireless elements of limited range may not be suitable if the density required to maintain network connectivity exceeds the desired measurement density required for monitoring. Moreover, many applications require either retrieval or car|ful tracking of the network platforms deployed—daunting tasks if one needs to deploy large numbers of nodes per unit area. Another metric to consider is platform size. Because of Moore's Law, the knee-jerk reaction to technology is that smaller is better. However, this is not often the case. Smaller solar panels mean less energy harvesting, smaller batteries mean less power available, and smaller antennas mean less radio range. Furthermore, many sensors used in field applications, though compact and inexpensive, are not MEMS devices and therefore cannot be integrated into the system at the subchip level. For these applications, the sensors are the limiting factor in pod size, so it makes little engineering sense to spend time, effort, and money to shrink only portions of a pod without considering the specific application and the pod as a whole. From this discussion, it should be apparent that for Sensor Webs, and wireless sensor systems in general, one size does not fit all. Some applications, such as monitoring the environment of an office building, require a high density of measurements in a ýight space, while others, such as irrigation of a field, require a lower density of measurements over a larger area. There is no reason to expect that the same wireless system will be optimal for both measurement scenarios. What will be the same in either case, however, is the governing Sensor Web principle that collected information is shared and used by pods throughout the instrument for reactive and adaptive purposes. The Sensor Web is about to move into a new development phase, focusing as much on applications as technology. Current Sensor Web pods are robust and stable, suitable for a variety of monitoring challenges, and accommodating an array of sensors. It is as if we have acquired a new computer, have loaded the operating system, and are now ready to load the actual software applications. As the Sensor Web infrastructure becomes more common in various user communities, there will be a demand for associated sensors to populate these systems. The drive will be not only to improve the fidelity, size, and cost of existing sensors but also to provide new sensors with capabilities to augment new monitoring requirements. As a result, the combined exponential growth of both computer and telecommunication technologies will contribute to a similar explosive growth of sensor technology.